Contact Florida Auto Crash Lawyer Gerson & Schwartz, P.A. Uninsured and underinsured motorist coverage is a contractual option that all insurance carriers must provide to registered vehicle owners here in Florida. Under Florida law, all insurance companies are required to offer UM coverage. This type of automobile insurance is available to protect you, your family, pedestrians, children, and resident relatives that reside in your household but that do not own a vehicle. The rationale is that our law doesn't require drivers to carry bodily injury coverage so it offers additional protection to Florida drivers. Uninsured is also referred to as UM, and provide a legal remedy for accident victims. It protects against uninsured or under insured motorists such as passengers, and pedestrians even though the driver who caused the accident may not have any insurance or has inadequate coverage limits. Other states that don't follow the no fault system require drivers to carry bodily injury protection. Depending on where you live, who you live with, and where you insurance policy was issued was issued will play a role in what auto insurance proceeds are available to you. Our Miami, Florida uninsured and underinsured motorist attorneys specializes representing clients that are seriously injured in car accident and automobile accident cases involving uninsured and underinsured vehicles. Our car accident lawyers have experience handling uninsured and under-insured motorist cases which date back to a landmark decision by the Florida Supreme Court where our firm established the rights of our clients to recover more than one uninsured/motorists policy for the same accident. In legal terms this is referred to “stacking”. Under Florida law, insurance companies are required to offer uninsured and under-insured motorist coverage benefits to vehicle owners. Our attorneys are here to evaluate all potential insurance policies that may provide you with coverage and to help evaluate the merits of a potential uninsured or under insured motorist claim. For more information on how we can help, contact a uninsured and underinsured motorist lawyer at Gerson & Schwartz, PA today for a free consultation. Under Florida law, insurance companies are required to offer uninsured and underinsured motorist coverage to all policy holders and get policy holders to "reject" coverage. This must be in writing. If they don't, insurance companies are required to provide uninsured motorist protection by operation of law. Many Florida drivers do not know that they can purchase underinsured insurance to cover the costs that the negligent driver’s insurance will not be able to. This coverage can protect you and your family members, even when traveling in a car other than your own. It operates as a safety net to protect you from the costs that are not your fault if you are unfortunately confronted by a motor vehicle accident. Florida is also one of a handful of states that follows what is called "no fault" insurance benefits for car accident claims. Under Florida law, vehicle owners are required to carry a minimum of up to $10,000 worth of insurance to cover drivers and passengers for medical bills and expenses. This insurance is available to car accident victims regardless of who is at fault. The proceeds are paid by the vehicle owners insurance company. Because Florida follows the "no fault" system registered vehicle owners are not required under the law to carry bodily injury insurance. At Gerson & Schwartz, PA our uninsured and under-insured motorist attorneys can help you establish an uninsured or underinsured motorist claim if you or a family member are seriously injured in a car, auto, or motor vehicle accident. When we drive and someone else causes an accident, we expect the negligent drivers to compensate us for our injuries. Unfortunately, many drivers are watching their pennies as well and have opted to get the minimum coverage or not to get insurance entirely. In fact, Florida has one of the highest rates of uninsured motorists in the country. Did you know that drivers can get insurance with coverage as little as $10,000? More than 20% of drivers in Florida do not have any car insurance. Even if they do have coverage, some drivers decide that they do not want to cooperate and flee the scene of the accident. Those hurt in this way may try to file a claim through their own insurance company only to find that support is lacking. 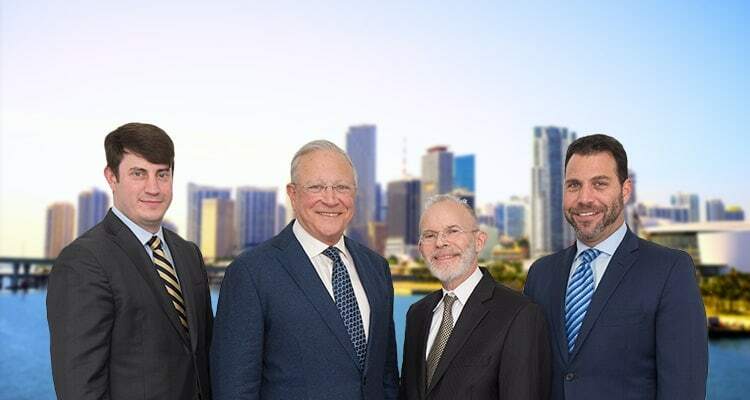 The Miami uninsured and underinsured motorist lawyers at Gerson & Schwartz, PA are here to help. Insurance companies are often only concerned about their end costs and do not sympathize with the ordeal of an accident or the injuries incurred. They will not take all of the factors of your accident into account and may only cover a small percentage of your total damages. We want you to know that the law is on your side. Even though Florida does not require that drivers have insurance that covers bodily injury to another person, laws have been put in place to cover these costs. Complicated insurance policies and state laws are the best reasons to have an experienced Florida personal injury attorney guide you through the aftermath of your accident. Contact one of our Miami, Florida car accident attorneys for a free consultation so that we can brighten your future commute in our Sunshine state. Cutting down on insurance costs does not mean that you should be unfairly burdened with costs. Call us at (305) 371-6000 or email us at info@gslawusa.com as we want to fight this battle for you.